Paul Pogba has received a backlash from some Man Utd fans after seemingly leaving the door open to a move to Real Madrid. 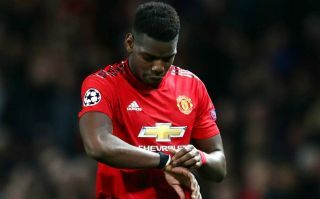 The 26-year-old has been in fine form since Ole Gunnar Solskjaer took charge on an interim basis in December, leading the Red Devils back into contention for a top-four finish in the Premier League. Further, Sky Sports note how the French international was even publicly insisting that he hopes Solskjaer is appointed as permanent boss this summer on Wednesday. However, in a rather bizarre move, he has also discussed Real Madrid while away on international duty and appears to have talked up the possibility of a switch to the Bernabeu with Zinedine Zidane having now returned to the Spanish giants. “As I’ve always said, Real Madrid is a dream for everyone. Let’s talk about one of the biggest clubs in the world. Now Zidane is back as a coach, it’s a dream for anyone who loves football,” he is quoted as saying by Goal.com. Unsurprisingly, that hasn’t been met with the most positive of responses from many Man Utd fans, as seen in their tweets below as Pogba has come under fire for talking about another club. The World Cup winner was named as captain for the FA Cup clash with Wolves last weekend, but now judging from the reaction below, many are questioning how he can wear the armband if he is going to come out with such comments. Time will tell if he moves to clarify what he said to appease any United fans he may have upset, but clearly it doesn’t look as though he has done himself any favours on this occasion while Man Utd could well be concerned about his future plans. This is everyone’s captain? ? I’m not trying to be reactionary but that quote from Pogba was at the wrong time and it further proves to me where his head is at and it’s not in the PL long term. Man, he talks too much sometimes. With all the love and support fans give you still saying things like these. He’s not for the long haul that’s for sure. Some United fans actually want this guy as captain ??? .